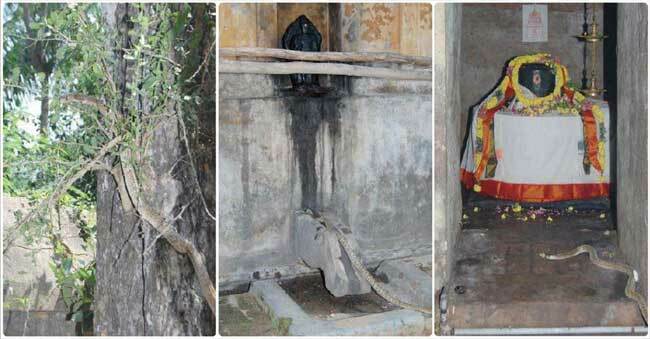 Theperumannalur Ruturaksheshwarar Temple: Mystery of Cobra Doing Archana for Shiva Lingama Miracle TO witnessed Eyes! Theperumannalur, a small village sited near Thirunageswaram railway station which is next to Kumbakonam Station. The main deity of this temple is Viswanathar(Lord Shiva without reincarnation) and his wife is Vedantanayaki(Goddess Parvati). What is the eminence of this temple? Here it is believed that worshiping Lord Shiva who took the form of Ruturaksheshwarar, will become more beautiful and will not have reincarnation (rebirth). We get the opportunity to first worship Lord Ganesha when we enter the temple. Lord Shiva is also called as Annadhana Shiva. Since the Shiva Linga is covered with ‘Rudraksha Kavacha’, it got the name Ruturaksheshwarar. The Dakshinamurthy Idol present here is rare and thought to be more powerful and boon bestowing than anywhere else. 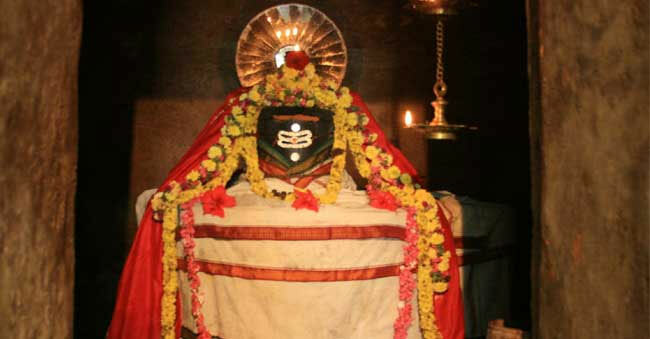 There is a Shiva Lingam in whoseAvudiyar amaragada is fixed inside on which light from the sun falls every day.It is believed strongly that the power of lingam is to be the combination of all the 12Jothirlingams located in India and hence considered unique. It is the only temple where Archana to Lord Shiva is performed with Rudraksha starting with Eka mukha to 12 Mukha Rudrakshas grant boons and purusharthas as required by devotees. Deities present in the temple are Vigneswara, Shanmuga, navagrahasannathis. There is also a temple tank on the eastern side. The power of this temple is such that Rahu and Kethu doshas are taken off. The couple who come here for children is bestowed with kids. There are many more great things experienced by the devotee. To have such experience you surely must think of visiting the divine shrine at least once keeping all other things aside. It is the biggest mystery so far about the Cobra doing Archana to Lord Shiva. But thousands are an eyewitness to this beautiful miracle that took place in the year 2010, on January 16th. The priest present then explained, “I saw it here right over here, it came and started doing the Archana during the Solar Eclipse time to wash off its sins”. At the Theperumannalur Shiva Temple, devotees in large numbers who witnessed the miracle of a Cobra doing Archana for Shiva Lingam with Bilva leaves are awestruck by the whole incident, unable to explain what they saw except chanting the Lord’s name, “Om Namah Shivaya”! Having discussed earlier also, the temple’s main deities are Vedhanthanayagi (Shakthi) with Viswanathaswamy (Shiva). It is been customary to do Archana only with Rudrakshas. 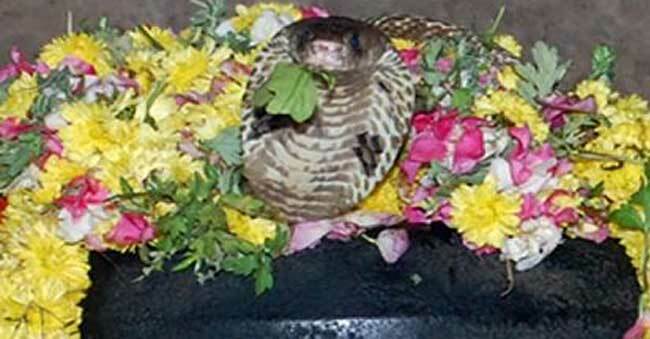 People along with the priest, Sivachariar Satish of the Temple, shared that they noticed a cobra entering the temple and lying on top of the Shiva Linga since yesterday morning, just minutes before the Solar Eclipse started, at around 10:30 am. 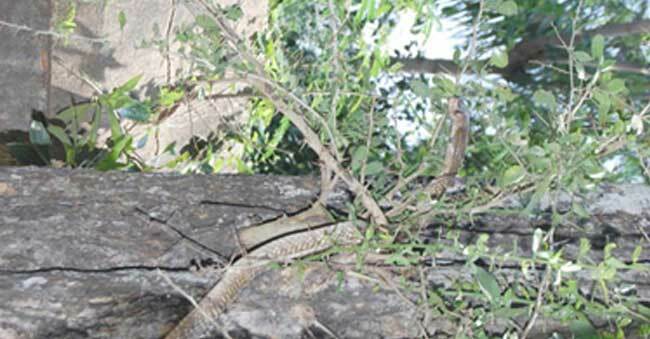 Later the Snake slowly descended from the Lingam and went towards Bilwam tree which is Sthala Vrikshum – Holy tree of the temple. It climbed the tree and picked a Bilwam leaf and returned back to Shiva Sannidhi. The priest also shared that they all noticed the snake hissed at every devotee that tried to go near it. It again climbed onto the Shiva Linga and opened its hood only to drop the bilwam leaf on Lord Shiva. The priest tried to explain it further, it is an act of devotion towards its favorite god on the Solar Eclipse day to wash off its sins. One cannot say much about the mystery but the miracle was witnessed by the excited devotees. The cobra did not stop at that, it repeated it again and again for few times. Once the news spread, in and around the village, hundreds of villagers rushed to the temple to have the magnificent and glorious Darshan of Lord Shiva with Cobra lying above him. If not similar, but many instances involving the shrine of the god are been seen around the globe. 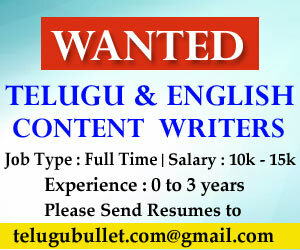 In the state of Andhra Pradesh, Sri Veera Brahmendra Swamy’s Kala Gnanam also consisted of many such predictions. And interestingly many have come true. India is undoubtedly a land of mysteries and surprises. In places like Kasi, there exists a Siva temple at the end of every corner, waiting for us to be discovered. Many of the temples go unnoticed. While in Rajasthan, the Balaji Temple is known to cure anyone possessed by evil spirits or demons. It is also important to remember few recent incidents that clearly tells us the presence of ‘divine’ spirit. The 2013 Uttarakhand floods had a devastating impact in and around Kedarnath. But astonishingly, everyone who stayed inside the Kedarnath temple was not harmed and even the Nandi and other idols located in the temple remained unmoved and untouched despite that heavy calamity surrounding it. While the science community was shocked, people who had faith in God and in his miracles thanked the Almighty for saving them. We all hear such mysteries and miracles all the time, but seeing it really would be astounding to all those present. Let us try once in our lifetime to move our steps towards this powerful and divine temple in Thepperumanallur. Thepperumanallur village is near to Thirunageswaram railway station, which is next station to Kumbakonam. It takes around 7 minutes to travel from Kumbakonam to Thepperumanallur Shiva Temple. Approximately around 6kms or 3.7 miles driving (by car) distance between Kumbakonam and Thepperumalnallur Shiva Temple. Timings of Temple: Morning: 6 am – 12 pm, Evening: 4 pm –8pm. Landmarks: Near to Oppiliyappan temple and Ragushalam. Importance of the Shrine: By worshipping Lord Shiva, devotees believe that this would be their last birth, and they will be not entitled to the birth-cycle anymore. Address: Thepperumanallur Shiva Temple, Kumbakonam Taluk, Thanjavur District. Accommodation: Cannot promise five-star accommodation, but decent Hotels are around with local food. If your stay is in Kumbakonam, You can avail better hotels, and food to rest and cherish your visit. Next articleImportance of Stress-Free Life – Changes that help you Overcome Stress!